Casa Amapola in Calpe on the Northern Costa Blanca. An area with more blue flag beaches than any other Spanish region. 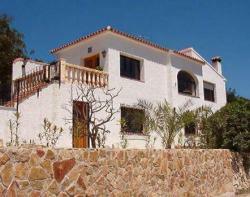 This villa has been completely refurbished & modernised with 3 bedrooms & 3 bathrooms with private pool & glorious sea views. The villa is set in a large mature garden with a lovely old carob tree which provides welcome shade mid-day. Under the tree is a swinging hammock seat, perfect for an afternoon siesta or sipping cocktails early evening. The private pool is just 10 steps from the house & has the sun on it all day, so swimming late into the afternoon is no problem! The outdoor dining terrace next to the kitchen is great for alfresco dining. From here you have superb views of the coast & the mighty Calpe rock rising 330m out of the sea. Now a nature reserve worth a visit. Bars & restaurants are within walking distance but you'll be spoilt for choice with so many fabulous restaurants in Calpe town (10mins) & along the coast. Michelin star restaurant within 15mins drive too - The Girasol. The villa has 3 bedrooms; 2 are doubles & 1 single. One of the double rooms also has a sprung action sofa bed. All rooms have ensuite bathrooms. The large lounge comes equipped with wide screen TV, full SKY satellite TV, video player & videos, DVD & CD player, board games & books. Air conditioning in the upper level only with free standing fans in the bedrooms. 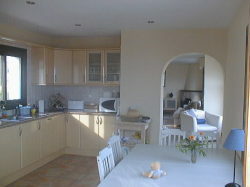 The kitchen is modern, bright & with quality fixtures & fittings. Dishwasher, washing machine, fridge,freezer, microwave, toaster & all the utensils you'll ever need! This is our home & we've tried to make sure you have everything you would ever need on a holiday.